I find it a travesty that such a large March for Life in Washington, D.C. is deliberately ignored or worse, distorted by the so-called Mainstream Media. 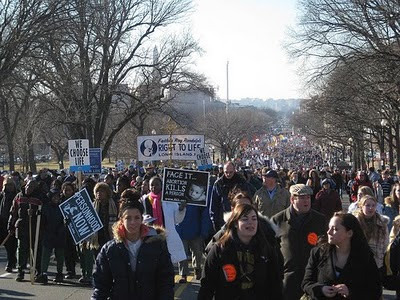 This article from the National Catholic Register sums it up: March for Life Final Update – Media Lies by Steven Greydanus. The comments are also worthy of reading too, from the people who were actually there. It is really no different from last year. How many people heard on their local news about the many LOCAL Marches for Life around the country, too? Looking at the quantity of marchers in D.C. and the fact there is a vast sea of young people, especially young women, the “pro-choice” legislators and supporters around the country should take note and realize that these people are learning very quickly that their voices are being deliberately squelched and they will not tolerate it any longer. If the media are determined to lie, they will pay the penalty by being distrusted and ignored. Perhaps that is why Fox News is now number one and CNN one of the lowest rated. These young people will be in charge soon, and hopefully this will be a boon to our country and our world. And of course, to the millions of children who may be aborted if substantial change does not occur. To those who are soldiering on in the face of what seems like overwhelming obstacles – keep going – your sacrifices are not in vain. You’ve Got to Be Pretty Low…. 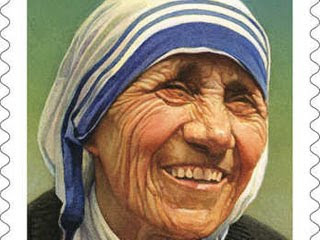 You have got to be pretty low to protest Mother Teresa: Atheist Group Blasts Postal Service for Mother Teresa Stamp. One of my friends, Katherine, has a beautiful little boy named Kael who is almost three. Kael has a very serious form of epilepsy called Dravet Syndrome. It causes sometimes constant seizures. They have tried everything imaginable for this child and it has been heartwrenching over the years to see the horrors of this disease and its effects. I can’t imagine watching your child having long lasting seizures, turning blue, and wondering if this is the seizure that will kill him or give him serious brain damage. One trip to the emergency room after another. One doctor, one powerful drug after another. You never get a chance to rest. and read about this amazing family. And most of all please pray for them and for a cure for this devastating disease. 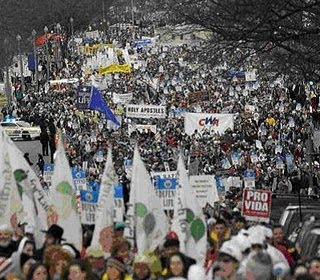 January 22, 2010 will be the “March for Life” in Washington, D.C. As in previous years, coverage by most news media will probably be very sparse to non-existent. EWTN however, will cover this event LIVE as well as the “Walk for Life West Coast 2010″ on January 23rd. Pro-life organizations estimated the crowd last year at 200,000 at least – as you can see above. Leading secular news media downgraded it to “thousands” or “tens of thousands’ and gave prominent time to a small handful of pro-abortion protesters who were rarely seen. Click here to see EWTN’s complete coverage, both on the network and online, with live streaming audio and video. This also includes all the special pro-life programming in January. 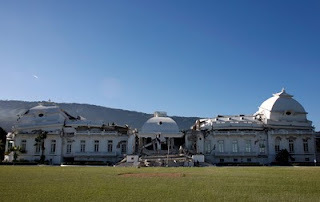 The Presidential Palace looks to be destroyed. 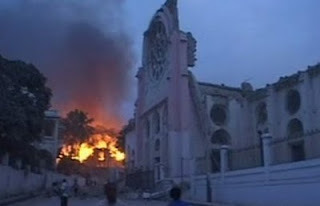 The Cathedral of Our Lady in Port-au-Prince is also destroyed. Archbishop Joseph Serge Miot of Port-au-Prince and hundreds of priests and seminarians are dead. Millions are homeless. 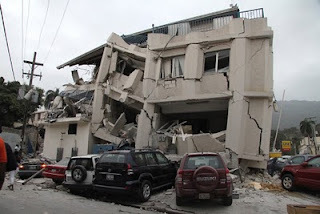 Buildings were poorly built and certainly not built to withstand earthquakes. At least 16 UN staff dead and 150 are missing. At least one hospital has collapsed. Here are some more pictures at Boston.com. I urge you to go The Anchoress blog for more comprehensive coverage and where to donate. Our donation is going to Food For the Poor which has a long term history providing Haiti with food and aid. When life in Haiti is difficult at best, heartbreaking usually, this tragedy is stunning. I know personally so many wonderful Haitian people. They are hard workers, compassionate and with deep faith. I ask you to help in any way you can, most especially with your prayers. UPDATE: While the President and his wife have survived the earthquake, it appears that most of his government is missing, with many, if not most, presumed dead. Please also read: “We are called…to be a light” at Whispers in the Loggia shows the pain of Haitians in the U.S.
Also, read Miami Haitians share grief, comfort and hope at Mass at the Miami Herald. The Archdiocese of Miami also is involved in help for Haitians in both the U.S. and on the island. The Miami Archdiocese is the home to the second largest group of Haitians in America (the first is New York.) They have been instrumental for years in providing support for Haiti through all it’s tragedies and crises, and supporting Haitians here. Ever since I came back to the Church 14 years ago, I have been interested in learning how to pray well. I always seemed to be grasping at straws though. At first, prayer was a quick spontaneous message to God or short written prayers. I recently found a piece of paper with those little Morning and Evening Prayers that I had stuck in a book. They were nice little prayers and a good place to start. Next, I had to relearn the “Our Father” since I could only remember part of it, and I needed a booklet to learn the Rosary, with a little refresher course on the “Hail Mary.” For a long time however, I was pretty dissatisfied with my prayer. If I had been more disciplined that would have helped, but I knew there was something more – I just did not grasp what it was. Some people said that that was all there was. You talked to God, maybe listened for some sort of feeling, and that was it. You were not to expect anything that awe inspiring. Oh…maybe there were some people who did, but they were extraordinary. I wasn’t really comfortable with this answer. I generally felt that there had to be more. That there was a relationship with God there, but I needed to find it. I just did not know how. What did you do to get closer to God? Oh, you followed the Commandments as best you could and you went to Church but….there was something else…but what? I read lots of books on prayer and they were all very nice. I had some lay spiritual directors, but they were not very well trained and I was left disappointed. The books said to just talk to God and I did this. I talked to him in the car, and when I did stuff at home. I tried to find a consistent prayer time to spend with Him. I went to Eucharistic adoration and daily Mass at times. I read the bible and tried to get “lights” from it, which is reading a passage and seeing what strikes you and what it says to you in your heart. And yet something was still missing. I knew there was more. Then, one woman I saw a couple of times for spiritual direction was actually pretty helpful and suggested that I read Fr. Thomas Dubay’s book Fire Within: St. Teresa of Avila, St. John of the Cross, and the Gospel-On Prayer . I had thought that this was a book that was going to be too difficult. 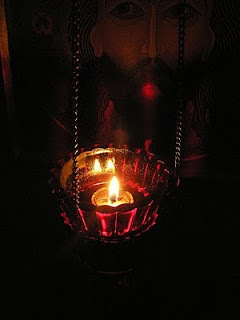 That it was for someone who was advanced spiritually. St. Teresa of Avila would be hard. She would be so lofty and and above my head that I would just be wasting my time. The spiritual director though, told me that that was not the case. And while someone who was just beginning might not want to delve into it, it would be a good idea for me to read. She was right. The basis of this book is that these two saints, especially St. Teresa, really think it is necessary to learn what you are striving for in prayer, where you want to go. Kind of like a road map or a picture of where you want to travel to. If you have no idea, how will you get there? It is VERY helpful. It is not the kind of book you read in an afternoon. You take it in small bits and think about it. St. Teresa and St. John explain about what you are aiming for – and that is Contemplation, which is a true gift from God. It is not a technique – it is something God gives you. This is not an Eastern form of prayer, this is true Christian prayer and it is what I knew there had to be. While I am reading this book – and I’m still reading it – albeit slowly , I discovered a few weeks ago that Fr. Dubay has some audio series on EWTN about prayer. The two I’ll mention to you are Contemplation and Prayer Quest. You can listen to these free MP3 series (13 half-hour shows each) either online, save them on your computer to listen to later, or save and transfer them to an MP3 player. Fr. Dubay’s series on Contemplation is just excellent. I listened to it while I was in the car, and you can’t get any better explanation on this form of prayer than here. He really goes in depth about what it is, and how to recognize when Christ is calling you to a deeper form of union with him, and how to foster this in your life. It is a pretty complete package. Prayer Quest discusses our thirst for God, what are the impediments to growth in prayer, mediation, and time pressures among other topics. I have just started to listen to them and they have already helped me a great deal. Karen over at CatholiciCast has Fr. Dubay’s series laid out for you to see easily here and here. You might also find helpful, Prayer Primer : Igniting a Fire Within by Fr. Dubay. This book is simple, especially for beginners, but everyone would benefit from it. Remember, prayer is a journey that you are on until you meet the Lord face to Face. You will have missteps, fall-backs, confusion and the occasional frustration, but if you keep at it you will progress. You need to have a willing heart, more silence in your life and helpful reading such as the Bible. Don’t give up, just keep trying and God will provide. Congratulations to Thomas Peters (American Papist) on his joining CatholicVoteAction. May their collaboration be fruitful and blessed. Imagine the courage it would take to travel for hours to attend a secret Mass in someone’s home, not knowing if this time you and your family will be arrested and the priest sent to a prison camp. Imagine the courage it takes to just own a Bible or a cross in a place where that is punishable by death or imprisonment. We in the West take our freedom of religion for granted. Those in China and other countries around the world do not. While we whine that we have to go to Mass, or that the priest’s homily is too long, or that people are not dressing appropriately for Mass – people in countries that suppress Christianity are dying. Christians in communist China, especially Catholics, are seriously persecuted. Bishops and priests spend their lives in prison or labor camps because being Roman Catholic is illegal. 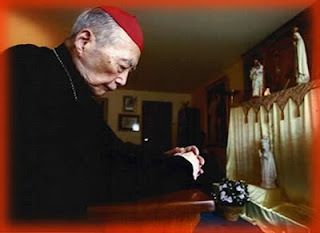 I read this today with both joy and sadness: Chinese underground bishop Yao dies at 87. Sadness because of what this man, Leon Yao Liang, had to endure most of his life, joy because now he is finally in heaven. Yao was ordained a priest in 1946 and assigned as assistant pastor, said the Kung foundation, based in Stamford, Connecticut. Yao’s religious activities came under increasing restrictions after the 1949 seizure of power by the officially atheistic Communist Party, which reviled Catholicism both as a religion and as a reminder of China’s past weakness in the face of expansionist European powers. He was “released” in 1984, but released just meant he traded one captivity for another. As you go about your day today, please pray for Bishop Yao and for those in China and other countries that Christianity is outlawed or persecuted. You can read more about the situation in China and what you can do to help by going to the Cardinal Kung Foundation website. Do you ever get a thrill when you discover a really cool new thing? What does it for you? New car? An iPod? For me it’s books or a website with stuff I have not seen before. Yeah, I know it’s pretty pathetic, but I’m a bookworm by heart and always have been. Yep, I was the teenager that hung out at the library. I was the one who checked out dozens of romance novels paperbacks at a time, and returned in two weeks for more. At one point, I decided that I would read 1000 books in ten years. I did it in three. I kept a log with the book’s name, author, and a rating from one to four stars. It was handy since I would forget if I read a book and would have to go back and look in my records before I checked it out. See, I told you I was pathetic. I’m at the point in my life that I have to be a little choosy because I don’t have a lot of time. I rarely read fiction. I really have not read much fiction for years. I just don’t like it anymore. I want to learn things, and truth is much stranger than fiction anyway. Last week, I finally got a hold of the latest Malcolm Gladwell book, What the Dog Saw: And Other Adventures. It is always a thrill to read the latest Malcolm Gladwell book and I might just go back and read them again. A few days ago I finished Beating Back the Devil about the disease detectives at the CDC. Today’s thrill was brought on by a post at Patrick Madrid’s site: Some Advice for Catholics Who Want to Study Scripture More Deeply. Mr. Madrid posted an audio clip from his radio show and gave the caller some great advice for resources he could use to learn more about scripture. Most of these resources I have known about but the last one… yay, something new! It is the Catholic Commentary on Sacred Scripture series. And I’m looking forward to seeing it. I immediately ordered one of the volumes from interlibrary loan and I will let you know what I find. In the meantime it looks great, here is a sample page for your viewing pleasure.